As tourist season approaches, many, wanting to come to Newburyport – will be seeking a memento and products that are unique to our city. Still others, drawn by the ‘feel’ of history; want to know more about our past. More often than not, they will be frustrated. They will poke around our funky shops downtown and will see products that are perhaps one-of-a-kind, or might even fulfill some fancy or need; but it will hardly be anything different than if you found it in Boston, Ogunquit, Portsmouth and Rockport. The Brass Lyon is a fine store just to the west of Market Square that covers many products that are uniquely Newburyport. Not only will you catch the ‘mood’ of the old Port of Newburyport – much of what they sell is rather classy. But the finest location of ALL THINGS NEWBURYPORT is the Custom House Museum Shop. This location contains architectural, historical and maritime books, gifts and merchandise that is unique to this location. They also sell Tour Books!!!!! OF COURSE, THE ONLY WAY TO GET THE STUFF IS TO COME TO NEWBURYPORT. 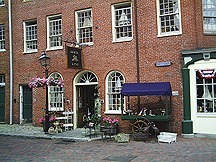 The Newburyport Printmaker used to have a store on Inn Street with many unique products such as greeting cards, maps, etc. They now offer these online. The Spirit of Newburyport has beautiful pictures of current-day scenes. And if you have a thirst for Old Newburyport, check out the Richard Burke Jones online art gallery. So even with these online links, as you can see, there is only one real solution if you want to obtain uniquely Newburyport items. * You won’t be sorry. This entry was posted in Architecture, Art & Culture, Businesses, Downtown, Eco-tourism, Entertainment, Heritage Tourism, History, Tourism, Travel, Waterfront. Bookmark the permalink.